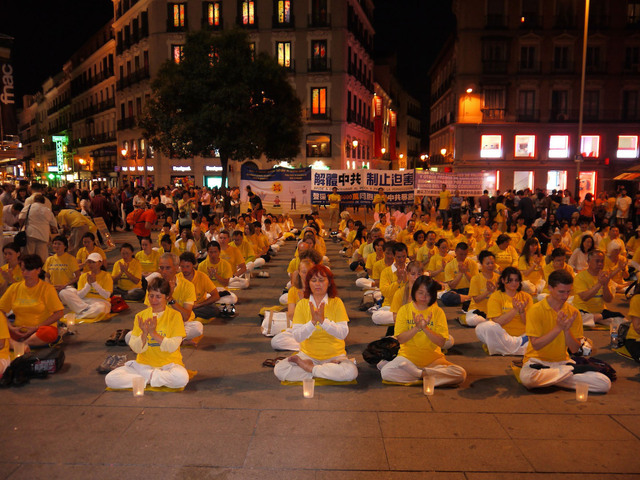 Falun Gong practitioners from all over Europe held a series of events in downtown Madrid to raise awareness of the suppression of Falun Gong in China. 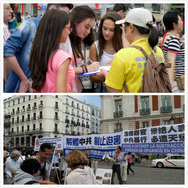 The events included a rally in the afternoon on October 3 and a march, rally and candlelight vigil on October 4. 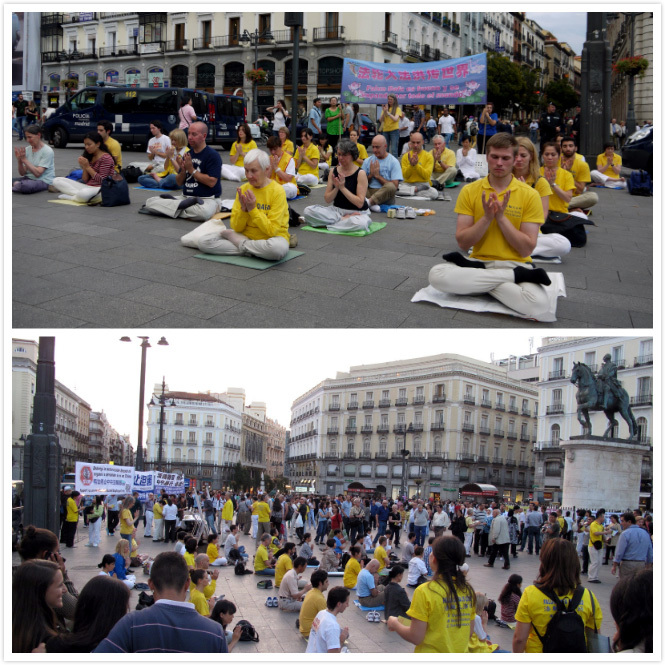 These events were followed by a conference, the 2014 European Falun Dafa Cultivation Experience Sharing Conference, on October 5. Practitioners from 35 countries attended this annual event. Practitioners gathered at the Puerta del Sol, ("Gate of the Sun"), Madrid's most famous and most central square in the afternoon on October 3. 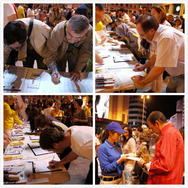 Seeing the peaceful exercises and posters the described the brutal persecution, many people stopped to sign the petition. Among them was George Neumann, an organ transplantation surgeon from Brazil, and his wife. Neumann said he had heard about organ harvest as early as 10 years before. He often went to international conferences on organ transplantation and the organ harvest in China was a topic often brought up. “I know this is real and international society has been trying to stop it. We [physicians] have also made such requests to the Chinese government.” He said that a large number of organ harvest cases had occurred. And they were from people who were imprisoned, not volunteer donors. 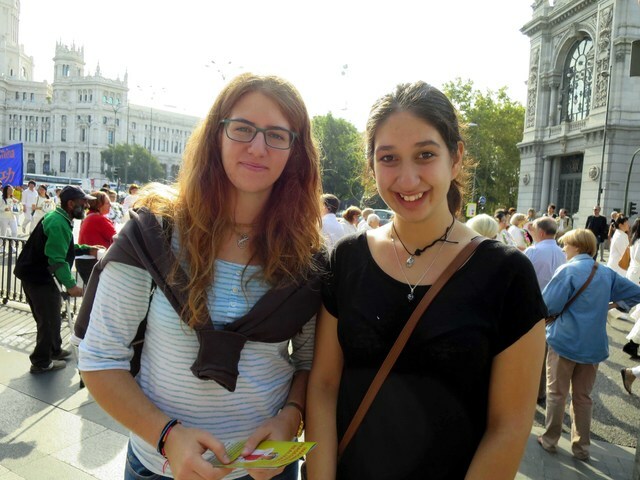 About 1000 practitioners participated in the parade and march on the morning of October 4, 2014, from the Plaza de la Independencia (Independent Square) to the Puerta del Sol. Many were surprised to hear about what happened in China and said they supported practitioners for their efforts. Joanna Fons and Gaterin, two college students majoring in naturopathy and journalism, respectively, accepted the pamphlet given by a practitioner and read it. 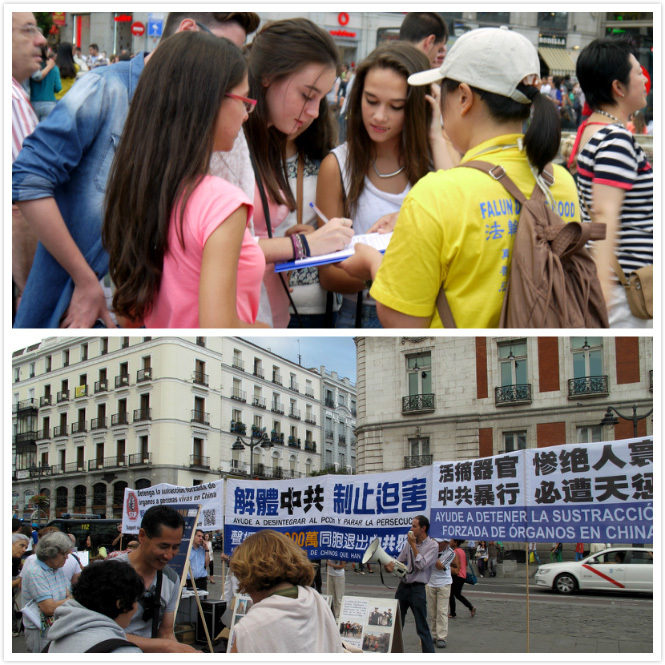 They said persecution such as organ harvesting is horrible and disturbing. Fons said, “The march you put on today looks great, especially the theme of peaceful resistance. It is something very meaningful.” Gaterin agreed with her, “Marches like this are a very good way to expose these atrocities so that more people learn about them.” They both asked what they could do to help. 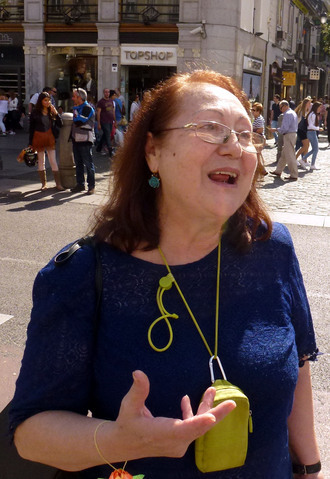 A rally was held at the Puerta del Sol following the march. Several guests gave speeches. Harold King, European spokesperson for Doctors Against Forced Organ Harvesting (DAFOH), is a dentist from France. He started to notice the organ harvest issue when he was treating some of his patients who had received organ transplantation earlier. He was pleased that Spain was the first nation that passed a law to prevent its citizens from going overseas for organ transplantation. “Recently we have talked about terrorism, but the CCP has been killing innocent Falun Gong practitioners and selling their organs for profit. Even at the rate of 10,000 per year, this atrocity is very severe and we have to stop it.” He said the CCP had a comprehensive organ supply system that connected patients to hospitals and military. “When this was exposed in 2006, the CCP promised it would change. But nothing has changed so far.” He called on everyday to sign the petition to condemn the atrocity. A candlelight vigil was held in the evening on October 4 at the Plaza de Callao, mourning 3,795 practitioners who had died as a result of the severe persecution.